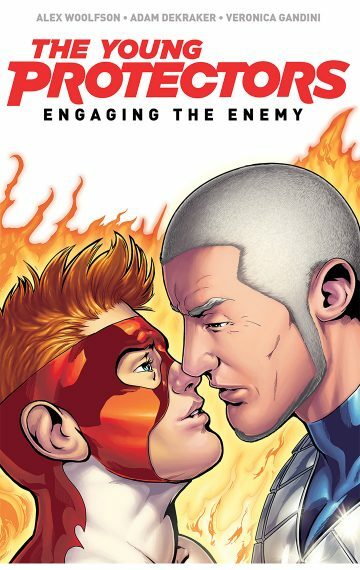 Signed by Alex Woolfson, this is a physical copy of the first trade paperback of THE YOUNG PROTECTORS: ENGAGING THE ENEMY, a multi-chapter superhero comic with explosive action, sly comedy, tender romance and powerful drama that both women and men will enjoy. It contains the Prologue, Chapter One, the Interlude, and the Spooky/Commander Bonus Story from the webcomic, along with exclusive bonus features, including an illustrated, newspaper article explaining the origin of superheroes in the TYP world! Kyle—a closeted, teen superhero who can control fire—has finally summoned up the courage to enter a local gay bar. It’s his very first step towards accepting himself. Unfortunately for him, his very next step out of the bar places him face-to-face with The Annihilator, the most dangerous supervillain in the world. And the price that The Annihilator demands to keep Kyle’s secret will lead Kyle down a path fraught with danger, adventure and unexpected romance. It’s a path that will force Kyle to question what it really means to be a hero and will ultimately thrust him and his young teammates into an epic conflict against vastly superior foes. 6.625″ x 10.25″. 160 pages. Full Color Paperback. FOR MATURE READERS.